Flickering tachycardia - what it is. Flickering tachycardia in adults and children, the heart rate on the ECG. There are such cardiac rhythm disorders that are potentially harmful to human health. A vivid example of this is a shimmering tachycardia, which many have heard of, but far from everyone knows what it really is and how to stop an attack on the heartbeat. A flickering tachycardia (MT) is more commonly known as "atrial fibrillation" or "atrial fibrillation". Some doctors use the designation "flashing tachycardia," yet the clinical picture of the pathology is more similar to the characteristics of arrhythmias. The spread of the pathology is extensive, as evidenced by the statistical indicator - one in 200 people in the world is experiencing attacks of flickering tachycardia. The disease is more common among men, with age, after 50 years, the risk of developing MT increases. The diagnosis of the disease is carried out without difficulty, as this is supported by the characteristic clinic of rhythm disturbances along with instrumental research. It is important to start the treatment of flickering tachycardia in time so that there is no worry about the type of disease that is dangerous to its complications. Pathology is a violation of the rhythm and conductivity, which is characterized by the appearance of the effect of "flickering" of tissues. The heartbeat may be in the range of 300-700 beats / min, with the atrium contracting more often than the ventricles, so the disease got a name such as "atrial fibrillation." A higher frequency of atrial contractions is due to the fact that an irregular conducting system delays a portion of electrical impulses, so they do not fully enter the ventricles. With this the relatively favorable flow, disease, because despite the disorder of normal activity of the atrium, the heart is partially able to fulfill the main function - blood transfusion. During the MT, the atria chaoticly twitch, that is, flicker, hence the name went - the flickering of the atria. How dangerous is flickering tachycardia? Long-lasting attack of MT is able to exhaust body reserves and lead to heart failure. It can also complicate the course of the underlying disease (IHD, myocardial infarction, cardiomyopathy), on the background of which the impairment of rhythm often occurs. Tachycardia is one of the main symptoms of MT. The heart rate can reach up to 700 beats per minute, so the pulse becomes frequent and weakly suspect. Some feel that the heart beats so much that it's about to jump out of the chest.Also, during an MT attack, the patient feels an irregular heartbeat. If the illness does not manifest itself, then this does not mean that everything is formed by itself. There are a number of complications, among which there is a thromboembolism of the vessels of various organs, often becoming the first signs of a previous flogging tachycardia. Therefore, if you are suspected of heart rhythm disorders, you should go through a cardiologist's examination. The disease in most cases is associated with organic pathologies of the heart when a heart muscle or valve is damaged by the effects of such processes as destruction, ischemia, dystrophy, inflammation. Therefore, MT often is a complication of diseases such as myocardial infarction, ischemic heart disease, myocarditis, insufficiency, or valve stenosis. "Heart tachycardia of festive days" is another possible reason for the emergence of MT, when after the abundant use of fatty foods and alcoholic beverages, the rhythm of the heart is disturbed. Hormonal disorders are a group of diseases that are often complicated by flickering tachycardia. Particularly high is the risk of developing MT in patients with thyrotoxicosis, when the thyroid gland begins to intensively produce thyroid hormones. 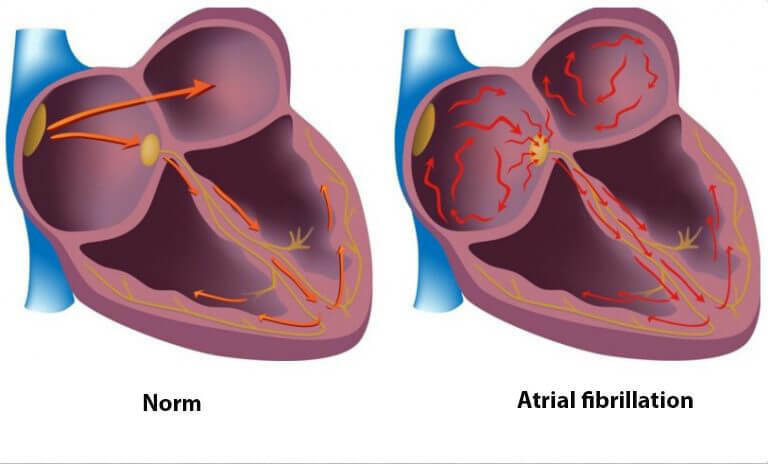 A combination of diseases such as diabetes mellitus, obesity and hypertension is dangerous, since in this case there is a much greater chance of atrial fibrillation. misuse of certain drugs (diuretics). The disease can manifest itself in three different forms: persistent, paroxysmal, chronic. Persistent MT - attacks of tachycardia occur infrequently, their duration is not high, are stopped by conservative methods of treatment. Paroxysmal MT is a pronounced first flicker attack that can last up to day, and in severe cases, up to seven days. It is not easy to stop with standard treatment methods, so electro-impulse therapy may be required. Chronic MT - the disease is continuous, between attacks there are short remissions. Patients are firstly examined using electrocardiography. 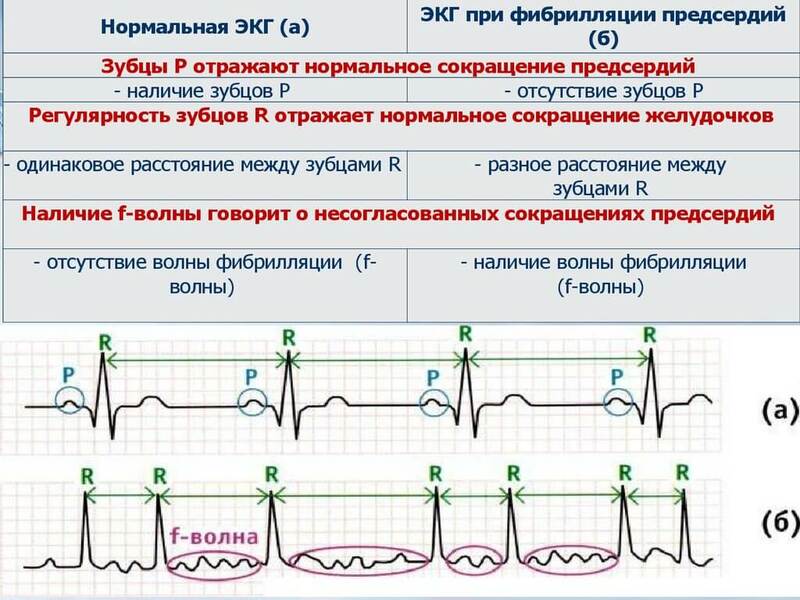 Atrial fibrillation, which is expressed in the replacement of atrial fissures with f-waves, frequent and irregular ventricular contractions and normal atrioventricular conduction, should be recorded on the ECG, at least in one lead. presence or absence of valve damage, cardiomyopathy or pericardial pathology. The chest X-ray is performed to exclude or confirm the pathology of the pulmonary system. Also using this method, the contours of the heart, its size, location are determined. Analyzes of serum electrolytes, thyroid hormones and hemograms are important from laboratory tests. Begins with the use of conservative treatment methods. If necessary, surgical methods of exposure are used, which allow to neutralize foci of the generation of pathological impulses. Today, several directions of therapy for patients with flickering tachycardia are considered. Appointment of medicines to help reduce heart rate. Slow down the heart beat blockers of calcium channels and beta-blockers. Often used to relieve tachycardia attacks of other forms of manifestation, and not just flickering. Use of drugs that control the rhythm of cardiac activity. First of all, these are calcium antagonists, and also have a similar effect with beta-blockers, digital drugs. The use of thrombolytic therapy, which is based on disaggregation, that is, drugs that prevent blood coagulation. All of these treatment tactics are often used in the hospital, after which his doctor prescribes antirecidiary treatment, taking into account those drugs that have been successfully treated with a flicker attack in the patient in the hospital.The selected drugs can be taken by the patient independently during an attack of rhythm disturbance. Prevention of seizures with antiarrhythmic drugs is widely practiced. Some medications, for example, propanorms, are used both for rescuing paroxysms and for preventing recurrent attacks. Accept the medication only after a preliminary medical consultation. It is used in the case when antiarrhythmics do not allow to achieve the proper effect. According to the indications, one of the following methods can be selected. Radio frequency ablation. With the help of special equipment, a pathological site in the myocardium, which participates in the formation of a flickering tachycardia, is determined, after which its destruction is carried out by other instruments. The entire operation is performed through several small cuts, therefore it is considered to be minimally invasive and atraumatic. The highest percentage of recovery is observed in patients after catheter ablation, so this method of treating flickering tachycardia is most commonly used.